A loose ball from South Africa's new-ball pair was a rarity New Zealand could not afford to miss out on in the early exchanges. However, when they did stray, brilliance from South Africa's infielders minimised, and often prevented altogether, any damage. When Martin Guptill cut a wide ball from Lonwabo Tostsobe in the fifth over, Faf du Plessis took things a step further and ensured the opening bowler was finally rewarded for a terrific spell, pulling off a stunning take backward of point. Fully stretched and airborne, du Plessis plucked the ball from behind him and Guptill, not a bad fielder himself, gaped on in disbelief before heading back to the hutch. Having already pulled off the catch of the afternoon, du Plessis' fielding heroics continued through the middle overs, when he ended Kane Williamson's innings with a fantastic throw. Williamson had set off for a single from the non-striker's end, gambling on the fact that the swooping du Plessis could not go down and deliver an accurate throw at full pelt. The batsman was wrong. du Plessis' horizontal, mid-air throw found AB de Villiers' gloves inches from the stumps, and Williamson was out by a metre. Having roughed up Brendon McCullum and Rob Nicol with short stuff at startling pace in his first spell, Marchant de Lange reaped the reward for the tactic only several overs later, at the start of his second. Expecting another a ball at his throat, McCullum was moving onto the back foot almost before the ball was bowled, and was in a woeful position to play the full one that de Lange delivered. The ball caught the edge and looped to backward point to leave McCullum walking back three runs short of fifty. It wasn't a good game for bowlers trying to hit the blockhole on free hits. After Wayne Parnell overstepped in the 31st over, he floated a length ball on middle stump that Colin de Grandhomme blasted over cow corner for his first ODI runs. Later, during South Africa's innings, Kyle Mills' knee-high full toss disappeared to the same part of the ground - only this time, it bounced before it crossed the rope off Hashim Amla's bat. 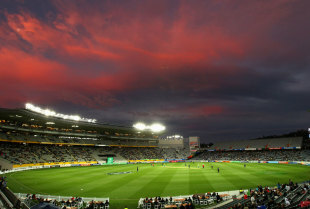 The groundstaff had the crowd on the edge of their seats with their cover-removing antics during the 40-minute rain delay during the New Zealand innings. They first brought the covers on, and were in the process of piling more on when the weather suddenly cleared and the umpires asked them to begin preparing for play. They then took them all off, but just as the pitch was completely uncovered, another squall washed through Eden Park and the umpires were eating their words. This routine continued for a further ten minutes while the weather made up its mind before, finally, the rain clouds blew over and stayed away for the remainder of the evening.